Yesterday was ThanksgivingLiving Day. I’ve been thinking …..
We can give thanks or we can live thanks. We can celebrate Thanksgiving once a year or we can add value to every day by living with an attitude of gratitude. ThanksLiving. I know …. finding ways to be thankful even when we have to drag in the excavation crew to clear away the crud to shine a light on fresh perspective. It’s possible with the right tools. Here’s one of them. Ready crew? Have you ever had a perplexing decision to make? Maybe you set up a piece of paper with a line drawn down the center so you could list Pros on one side and Cons on the other. Even if you’ve never done that, this ThanksLiving tool will work for you. Remember the tough job of excavation is to dig deep and move earth. 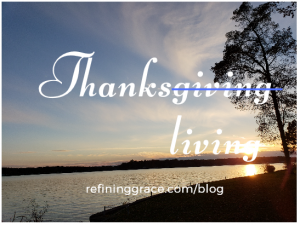 Instead of Pros and Cons, we’re looking for Thankful on one side and Troubled on the other. Let the excavation begin! We are entering the season of lists, kept where we can find them quickly to keep track of what to do or things to buy. Like those lists, leave this one where you can reach it quickly. We all have much to be thankful for and many things that trouble us. Before excavation of the land, you need a survey. What do you feel troubled about? Write it down. What are you thankful for? Write it down. There. That’s the easy part, the survey of the land. The next step, excavation – turning over dirt – digging deep – leveling the land – that’s the tough part. Ready for the challenge? 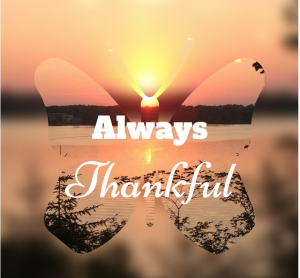 If you’re struggling right now, finding ‘thankful’ might be like straining concrete, but look around. Now put pen to paper and make it official. Some of the things we cherish the most are the things we are most thankful for. Why? Because they aren’t things we own, they are things we enjoy and have a relationship with. It seems impossible to be thankful for troubling circumstances, sadness, heartbroken loneliness, anxiety, frustrations, boredom, illness, and shattered relationships. Daniel experienced all those things. Yet the Bible tell us in Daniel 6:10 “Three times a day he got down on his knees and prayed, giving thanks to his God.” Daniel was a young teenager when he was snatched from his home and put to work in a strange land for a king who had not earned his allegiance. If I were Daniel, the last thing I would do create more trouble by praying with thanks to God. We think uttering the words ‘thank you’ is like lying to yourself or is the same as telling God you’re happy with the way things are, when in fact you feel like you have a hole in your heart and are deeply distressed. This thanksgiving to God is not a high five thank you; but instead is a time to tell God you’re not happy, you’re broken. In Isaiah 55:9 “As the heavens are higher than the earth, so my ways are higher than your ways and my thoughts higher than your thoughts.” Tell God you don’t understand His ways. Your life is a train wreck, and you don’t get why, but you are trying to trust him. There’s a verse in Proverbs 3 that says, “Trust in the Lord with all your heart; do not depend on your own understanding. Seek his will in all you do, and he will show you which path to take.” These verses set the stage for being thankful while you work through this season of sadness. God’s ways and thoughts are infinite; we see with human limitations. When we don’t depend on our own understanding, we are able to seek God and build trust in his sovereignty. God wants us to seek Him, not things. God wants us to dig deep and get rid of attitudes and actions that pull us further into the pit. Ask God to teach you what He wants you to learn from whatever is causing despair. Think of this as leveling the wreckage. We don’t know why, but God often chooses devastating circumstances to grow our faith and shape us into people who trust Him. We can question and even object, but we know that God says be thankful in all circumstances. 1Thessalonians 5:18 “give thanks in all circumstances; for this is God’s will for you in Christ Jesus.” Being thankful in all circumstances is never easy, but it will change your life; and change it for the better. This post is based on the writing prompt VALUE. Each week, Kate Motaung of Five Minute Friday, suggests a word and instructs us to write for 5 minutes without over-thinking, editing, or stressing. I’m new at all this, so I wrote for more than 5 minutes because I did lots of thinking, a little editing, and a fair amount of stressing. But – I did it and that’s where the value is. Thanks living I like that. Blessed to be your neighbor at FMF this week. Thank you, Tara. I haven’t participated often with FMF but I am trying to both catch up with the 31 days of writes and each Friday. I haven’t gotten the 5 minutes down yet. It’s a process. I enjoyed reading your post. I’ve been writing down things I’m thankful for each day for almost two years now and it has been such a helpful habit to establish! Thanks for visiting my blog today too! Writing things I’m thankful for has changed my life. In 2002 my husband lost his job in a mass layoff. I became the main source of income and we sold our family home to move into our cabin. A year later I was not doing well. I missed my family. Two grandchildren were due to be born and I just got sadder and sadder. I hid it well from everyone except my best friend. The only way I survived was writing down things I was thankful for every time I thought of something. In the days when I thought I was never going to be my naturally happy self again I grabbed my thankful list and read it and pray and sang praise songs. That list was a survival mechanism, my lifeline. I worked then so I’ve kept the practice except now I put thankful items in my joy jar. I’m glad you live thankful. I’ve met so many people who practice this thankful exercise. Be blessed and encouraged. Thank you for reading and taking time to share your practice with me. I should mention that after a year we moved to a small house close to my family again. I still was the breadwinner, but at least I was back where I belonged. God needed that time with me to shape my heart to be more like his. So many good thoughts here…thank you for doing all this thinking and challenging us to thanks-living! Thanks for your kind words and encouragement. I appreciate you. Gratitude truly does add value to each new morning – to each day! Enjoyed your post! Thank you for taking time to read and respond.Finding the good in a situation orliving thankful chsnges everything.